My ideal cup of coffee is poured from a French press and is brewed from freshly ground beans that were roasted within the week. And since we’re talking about ideal, it would also be delivered to me on a tray, in bed, and accompanied by a chocolate cookie. I like to think I make the world’s best cup of coffee; in fact in my barista days, I’m fairly certain I created the world’s best cappuccinos too, though I’ve had a few that have come close. Too bad for you I’m in barista retirement. Anyway, I felt that I should share my “recipe” for making a great cup of coffee at home so you can start the morning properly caffeinated. Your co-workers will appreciate it too. But first, if you don’t already have one, run out and buy a burr grinder. It’s a good investment. You’ll thank me later. If you’re just sticking with drip coffee, I recommend the Krups GVX1 burr grinder. (If you’re looking for a grinder for your home espresso endeavors, this one is not for you.) It’s a good size, not too bulky or noisy, and you can probably find an excuse to fit it into the budget if coffee is important to you. 1. Grind coffee no earlier than several minutes before brewing. 2. Heat water, preferably filtered, on the stove or in an electric kettle. 3. Grind coffee on French press setting—this is a coarse grind. 5. Let the water cool slightly before pouring over the coffee. You don’t want it to be “boiling.” This will affect the taste of the coffee. 6. Let steep 3-5 minutes. You may want to adjust the time depending on the coffee that you use. 7. Give in a good stir, then put on the top and press down. Oh look, it’s the best coffee ever and you made it! 8. Pat self on back, enjoy delicious coffee. If you don’t fancy the French press, or you think the murkiness of the finished product is not for you, try making your coffee with a manual pour over brewing device. They cost about five bucks and you can pack them up and take them anywhere. You’ll just need some coffee filters and you’re good to go. 4. Put your 3 Tbsp of coffee in and pout the water over slowly. You may need to give it a quick stir to make sure all the coffee is getting saturated. 5. Compost the filter (coffee is acidic and good for the garden). 6. Enjoy coffee while patting oneself on the back. 1. Try not to buy more coffee than you’ll use in a week. 2. Store your coffee in a cool dark place, such as canister. 3. Never freeze your coffee! I don’t care what anyone tells you, unless you’re stocking up because you live in a remote bunker and only leave the compound once a month for supplies, no, no, no. 4. Grind only as much as you need. If you want to learn more about coffee and prefer to do so through a book, I suggest you get a copy of Coffee: A Guide to Buying, Brewing, and Enjoying by Kenneth Davids. This book was recommended to me by my old boss, the roaster and owner of Cup A Joe in Chapel Hill, NC, and it’s the best I’ve come across. Davids takes you through the history, legend, harvest, roasting, and brewing of coffee. After reading it, the next time you go in to your favorite café/roaster, you won’t point to the unroasted greens and ask, “are those, like, dried peas or something?” I just saved you some embarrassment. You’re welcome. You can get a cheap used copy at abebooks.com. The cheapest “new” Krups grinder I can find on the net from a non-sketchy site is here. Krups also has one for $50, but currently lists them as “out of stock.” Suuure they are. Great stuff! I am glad you found me, it's great to have a fellow blogger near my hood. I'm off to check out your post on whiskey (be still my heart). Great post on coffee! Looks like I need to reserrect my French Press. oh yes, dig it out. a French press should never be dusty! 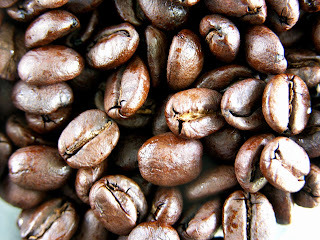 while freezing doesn't necessarily "ruin" the coffee, it does alter the flavor--especially considering that you need to thaw the beans before grinding them. moisture becomes an issue. 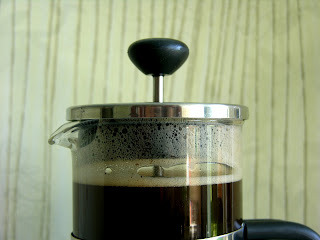 Bodum now makes an "indestructible" non-glass French press for people like us.